63 percent believes that discrimination against whites is as big a problem as discrimination against minority groups. 66 percent believes that the values of Islam are at odds with American values. 54 percent believes that American Muslims are trying to establish Sharia law in the U.S.
56 percent believes that newcomers from other countries threaten traditional American customs and values. 72 percent believes we should deport all illegal immigrants back to their home countries. This is apropos because there’s been a wee bit of discussion lately about whether tea partiers are a bunch of stone racists hiding behind the Constitution, or whether that’s just another offensive “race card” canard dreamed up by the usual suspects on the left. This survey probably won’t change any minds, and I happen to think the term “racist” conceals more than it explains anyway. 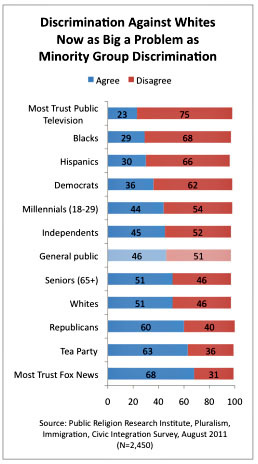 Still, what this survey does show is that tea partiers clearly harbor a pretty strong set of racial resentments. That doesn’t make them all racists, but it is a simple descriptive fact, and it’s something that’s perfectly kosher to discuss openly as it relates to public policy. As for Fox News, I think it’s safe to say that Fox considers tea partiers to be its core audience. And so its programming needs to appeal to that audience. This explains why Fox put Jeremiah Wright on virtually 24/7 rotation during the 2008 campaign, and why, over the past year or so, they’ve spent so much air time on Shirley Sherrod, anchor babies, Common’s invitation to the White House, birtherism, the Ground Zero mosque, Glenn Beck and “liberation theology,” Van Jones, the New Black Panthers, various reverse discrimination outrages, the D’Souza/Gingrich/Huckabee “anti-colonialism” meme, minority preferences from the CRA as the cause of the housing bubble, the general panic over Shariah law, and much, much more. Any one or two of those could be a coincidence. Put them all together and you’d have to be pretty gullible to believe that they were just randomly chosen topics. Fox News is America’s headquarters for festering racial resentments. The Brookings/PRRI survey is just one more piece of evidence on this score.